Success in any modern business is generally dependent on an effective online marketing campaign. While major corporations have staff dedicated to building a competitive web presence, most small business owners do not have that luxury. 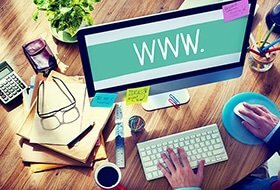 A small business website is often haphazardly constructed by a business owner or friend, and while some of these sites may be somewhat successful, they rarely provide the results small business owners need to maximize their profits. Selecting a quality company to design a small business website is crucial for the site’s success. With e-commerce garnering more consumer dollars every year, developing an effective website for small business owners is becoming an increasingly significant role for every professional small business website designer. With margins shrinking for many types of businesses, obtaining the best return on investment (ROI) is crucial. While that might suggest seeking the lowest cost web design company, often the opposite is true. Quality design services require time and expertise. Working with top professionals to design and optimize a website is a financially sound investment. Design professionals will walk small business owners through the steps needed to create a successful website. For any website, the business must decide what the focus of the site will be. The focus guides each of the next steps and must be clearly defined. Some websites may be purely informational, and that type of site is often the simplest to design, but if the purpose is to market a product or service, the website design quickly becomes more complex. All websites utilize one or more software programs to design and manage the site. Software solutions are available from a variety of sources to meet the specific goals of each small business. The beauty of available software is that it allows the website builder to design distinctive sites tailored to match the marketing goals and budgets of virtually any small business client. Of course no design is effective if no one sees it. Activating the website requires the use of a web hosting provider. There are many web hosting services available, and the company providing website design will generally recommend options to match each client’s needs. Selecting the best web hosting service depends on several factors. Designers and small business owners must analyze the expectations for the site. Shared hosting sites are generally less expensive than dedicated hosting services, but dedicated hosting services can deliver more efficient services such as faster page loading than lower cost options. Steps must also be taken to optimize search engine results. Simply activating a site does not guarantee hits, as many site owners can attest. If a site is not ranked highly be Google or other search engines, little ROI is likely. Area web professionals work with clients to optimize search results from top search engines. Search engine optimization (SEO) is the phrase that describes the steps needed to see a website at the top of the search engine results page. Being ranked highly is simply the best way to increase the number of hits for any web page, and SEO is the force behind garnering the top rankings. To maximize profits, the website must contain meaningful information e.g. content that has value to the site viewer. Professionals providing website services know the importance of continually updating sites to maintain the relevancy required by the algorithms Google and other search engines use. Small businesses working with top performing search engine optimization and marketing service providers can expect improved responses to their online marketing efforts. Are you a small business looking for results on the web? Look no further than SEO Zones, Inc. Please call our Denver, CO office today at 303-200-1000 to get started! You can also reach us by email at sales@seozones.com or by filling out the form on this page and letting us how we can with a new website or one of our other areas of service. Already have a website but is it mobile-friendly? Click here to take the test! Your SEO Guide to the Top! Call 303-200-1000 for a Free Consultation.